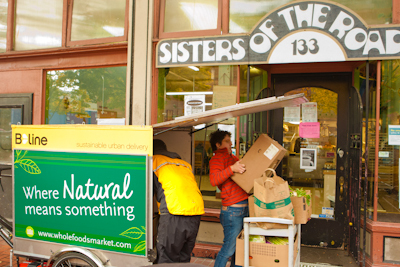 Sisters Of The Road has been supporting community-driven solutions to homelessness and poverty, in an atmosphere of gentle personalism and nonviolence since 1979. Sisters serves 225 meals a day to people living in extreme poverty and experiencing homelessness, and also engages in community organizing and nonviolence training. In just one month, the B-share program has delivered over 2,000 pounds of food, including fresh organic fruits, juices, and vegetables to Sisters.That’s equivalent to over 1,500 meals!